OTTAWA – Conservative MP Pierre Poilievre repeatedly tried to squeeze answers out of Finance Minister Bill Morneau during a marathon Commons session Tuesday night that featured a barrage of questions on the potential costs of the federal carbon tax for Canadian families. Poilievre was the first political rival to get a crack at Morneau during what was expected to last as long as four hours. Opponents have been keen to crack the minister’s message-track veneer, which includes exposing what the government’s carbon pricing plan will cost an average Canadian household. Morneau responded to the early flurry by saying those looking for specific net costs for households from Ottawa’s plan will have to ask for numbers from some of the provincial and territorial governments. The federal government, he noted, will provide provinces with a backstop if they decide not to introduce a carbon pricing plan of their own. Under that approach, Ottawa will return the revenues to the those provinces, Morneau said. From there, he said the provincial governments will be free to decide whether to reduce taxes for their citizens and by how much. “So, there is a real cost but only a potential refund to the individual taxpayer,” Poilievre said in response to Morneau’s answer. Morneau replied by saying about 85 per cent of Canadians already live in a jurisdiction with a carbon pricing regime. He named British Columbia, Ontario and Quebec as provinces with carbon pricing plans — and he stressed they all have strong economies. He also offered an example. Alberta, which also has a carbon levy, will provide families of four with income of up to $95,000 with an estimated net benefit of $40 in 2018 after the provincial rebate, he said. “To the extent, the provinces decide to give that revenue back to citizens they will be able to reduce taxes,” Morneau said. Poilievre got the ball rolling earlier in the day during question period, accusing the government of an ongoing “carbon tax cover-up,” refusing to say how much more families can expect to pay for everything from gasoline to home heating to groceries as a result of the measure. Environment Minister Catherine McKenna fielded that one, accusing the Conservatives of denying both the existence of climate change, the cost it is having from the impacts of major weather events, and the economic opportunity it poses in fostering growth in clean technology. “Canadians know that polluting is not free; it is having an impact right now,” McKenna said. She did not, however, ever produce any specifics on the government’s understanding of what it will cost the average Canadian family. Neither did she later when she answered questions at a Senate committee reviewing the government’s legislation to make the national carbon price a reality. The legislation, contained in the government’s spring budget implementation bill, would create a federal carbon price system that will be imposed in any province that doesn’t create their own system that meets federal requirements by the end of this year. Conservative Sen. Michael MacDonald said it is frustrating that the government continues to dodge the question about what that federal system will cost. McKenna said only that the carbon prices in place now are from individual provinces, each of which did different things with the revenues so the cost to people was different depending on where they lived. That answer did not make MacDonald happy. “You never came close to answering the question,” he said. When the government unveiled its federal plan last year, it did include the expected cost it will add to things like gasoline (11.6 cents a litre) and natural gas (9.79 cents per cubic metre). However, a government analysis of what those costs could mean overall for an average family has been withheld from documents released to date under access-to-information legislation. It is an argument sure to persist into next year’s election campaign. Conservative Leader Andrew Scheer has promised to scrap the Liberal scheme, saying he will have a plan of his own to meet Canada’s international emissions targets without putting a tax on carbon. Canada’s 2030 target is to cut emissions by 30 per cent below 2005 levels. Carbon pricing is the most cost-effective, efficient way to get there, says McKenna; any other plan would require regulations and policies that would likely cost industry and families far more than a carbon price. Earlier this month Environment and Climate Change Canada estimated that a $50-per-tonne carbon price would reduce emissions by 80 million to 90 million tonnes per year, at an annual cost to the economy of about $2 billion — not counting would-be growth in the clean technology industry, which some predict will grow by trillions over the next decade. The government’s numbers differ from those of the parliamentary budget office, which says the GDP impact will be about $10 billion a year. The office released a more detailed explanation of that number Tuesday, saying it reflects the difference between no carbon price anywhere and $50 per tonne everywhere. Ottawa’s numbers were based on the fact that four provinces representing about 80 per cent of the population already had a carbon price scheme of some sort in place or in progress before the government announced every province would be required to have one. 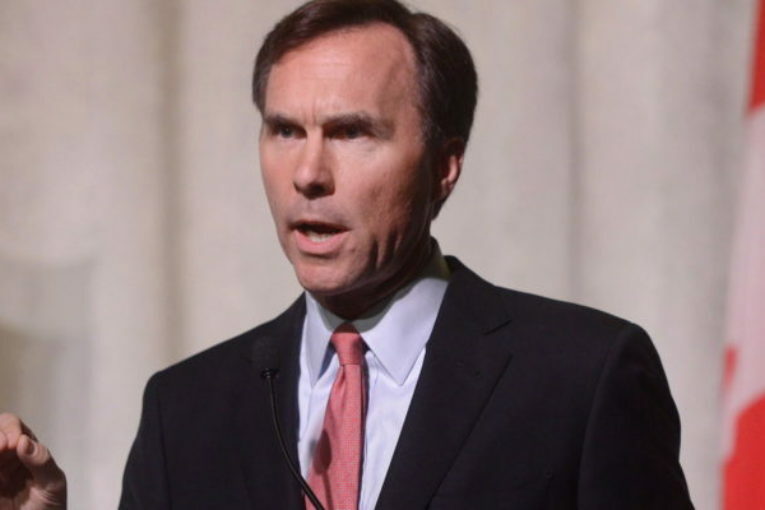 During the evening session, Morneau also faced questions from New Democrat MP Guy Caron over the Trans Mountain pipeline and the government’s promise last week to “indemnify” would-be investors in the Alberta-B.C. expansion project against any cost overruns resulting from political interference. Morneau has been in talks with pipeline-builder Kinder Morgan since mid-April after the company threatened to pull out of the project, spooked by court threats from B.C. The company has given Ottawa until May 31 to smooth the jangled nerves of investors. In response to Caron’s questions, Morneau declined several times to get into specifics, saying he’s in private discussions with Kinder Morgan. Prime Minister Justin Trudeau did not give many hints about the status of those talks Tuesday, but Alberta Premier Rachel Notley said they were progressing. “We are getting closer,” Notley told a news conference in Edmonton. She said she is “reasonably confident” a deal with Kinder Morgan will be in place before the end of the month.